Hermanus Golf Course is located just 120 Kilometres from Cape Town at the southern tip of Africa and ideally situated for inclusion in your Winelands or Garden Route golf holiday. 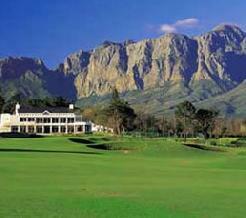 The Hermanus Golf Club offers the keen golfer an incredible golf venue. The course, which has been revamped and enlarged from 18 to 27 holes in 2007, is set in magnificent scenery with views of the sea and a backdrop of the mountains. 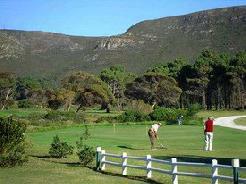 Wild life and natural Cape flora are attractive features and the many trees provide the beauty for ideal golfing terrain. The whale capital of southern Africa, Hermanus offers in season (July to early December) great golfing and the best land-based whale watching opportunities in the world. 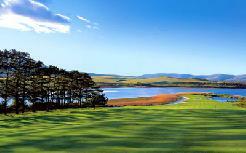 The Hermanus Golf Club has become one of the most popular golf courses in the country and, although a private course, has a friendly welcome for all visiting golfers. Signature Hole: The sixth hole is probably one of the toughest holes in the Cape. It has out-of-bounds on the right and trees to the left of this narrow fairway, demanding accuracy off the tee usually into the prevailing wind. 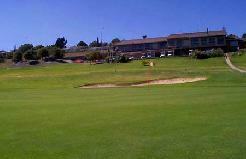 The green slopes uphill from front to back with a water hazard looming close by on the right.